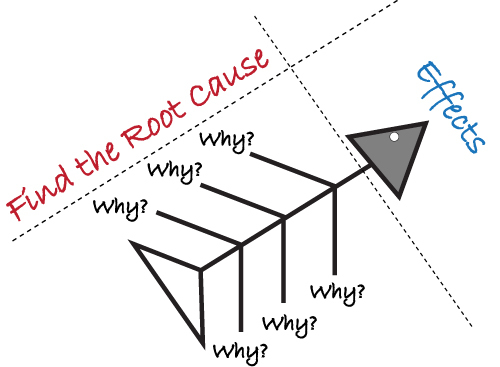 5 Whys and Fishbone Diagram are effective tools that can be used to locate the roots causes of a problem. 5 Whys is a problem solving tool that helps to get to the root of a problem. The basic idea is to ask “Why?” whenever a problem is encountered. Typically, the initial response will not trace back to the root of the problem it will only be a symptomatic representation of the overall issue. Fishbone Diagram goes by several names (Ishikawa, Cause & Effect, etc.) and there are a variety of ways to use. It is primarily a tool for organizing information to establish and clarify the relationships between an effect and its main causes. Fishbone Diagram is able to identify the root cause(s) of the problem so that collective actions can be taken to eliminate their recurrence, develop a picture composed of words and lines designed to show the relationship between the effect and its causes.